The Monster Bash 2013 featured Guests of Honor Ron Chaney, Donnie Dunagan, Janet Ann Gallow, Butch Patrick, Pat Priest, Gregg Palmer, John Saxon, Robert Dix, Veronica Carlson, Eternally Elvis, The Abbott & Costello UltimAte Tribute Show, Tom Savini, John Russo, George Kosana, Kyra Schon, Cortlandt Hull, Chilly Billy Cardille, David "The Rock Nelson," Son of Ghoul, Count Gor De Vol, Mr. Lobo, and many others! Photos provided by Phil Smoot, John Sargent, Bob Dix, Ted Lewczyck, Dan Day Jr., Clifton Curtis, Malcolm Gittins, Theron Statler, Paul Speidel, Brian Nichols, Joey Vento, Ted Lewczyk, Mark Wilhelm, Kevin Slick and others - thank you! 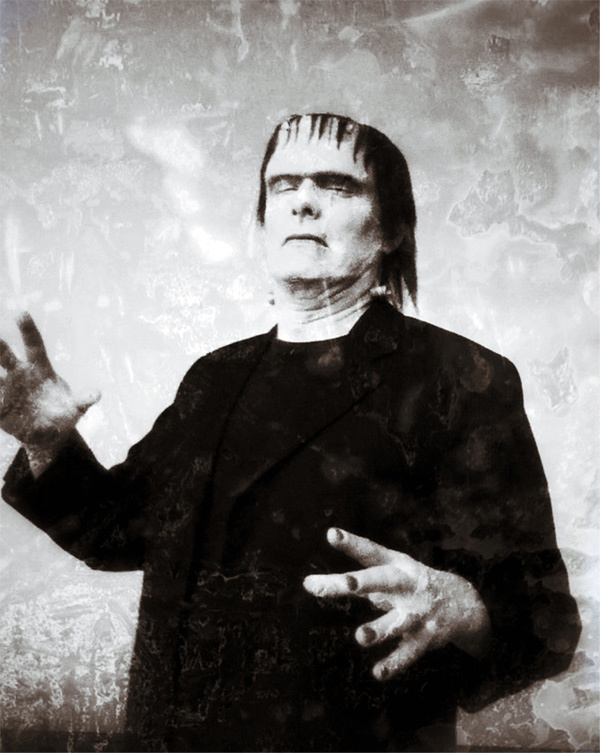 The ever present David "The Rock" Nelson again was turning Monster Bash into a set of his next epic motion picture! 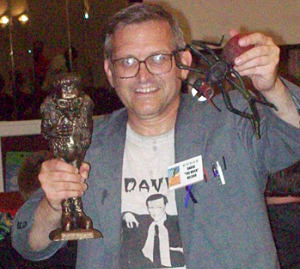 You can never forget David, or his "Devil Ant!". Becoming Grandpa! 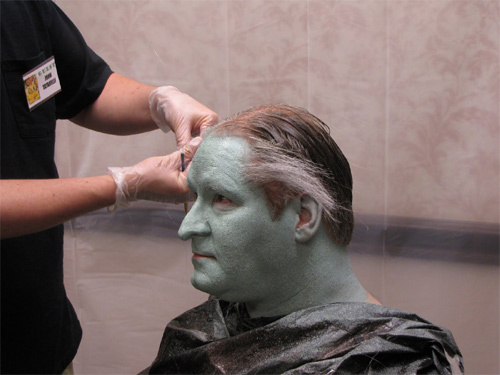 It's Ted Lewczyk being made-up as Grandpa Munster by John Tatarelli and The Reel Magik Team at Monster Bash. 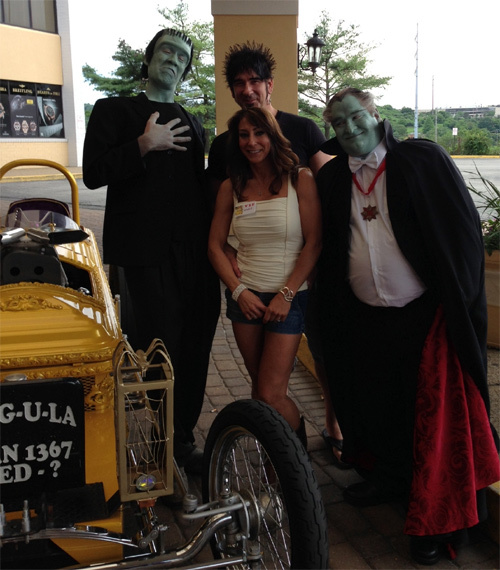 Completed Grandpa Munster (Ted Lewczyk) with Herman Munster (Thom Shubila), Bashers and the Drag-u-la out front of the Monster Bash hotel. Hey! Stop pulling Quasimodo's chain! Quasimodo was Leonard Hayhurst. . 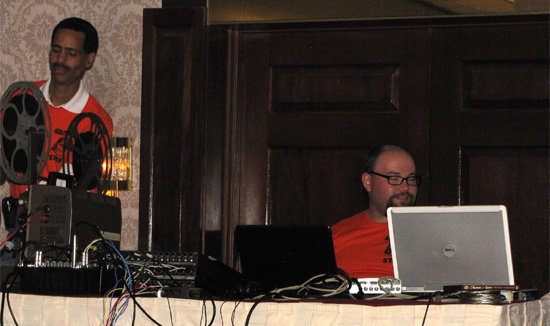 The projection team of Geoffrey Curtis and Brian Keegan at Monster Bash 2013. The lobby display thanks to Team Armellino! Zounds! 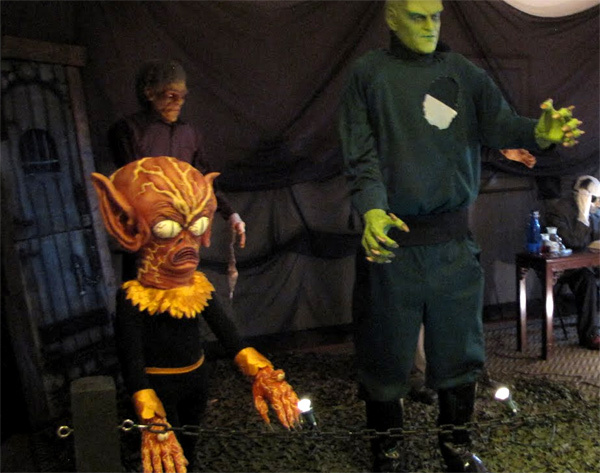 More monsters in the lobby, courtesy of The Jerry & Susan Armellino Family. 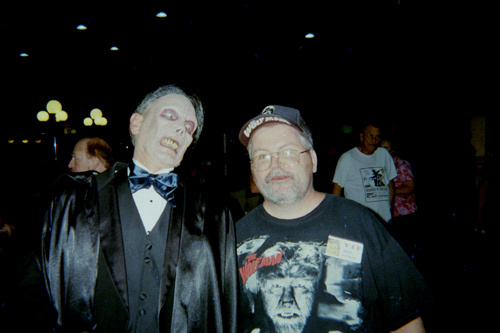 Ron Chaney as his great grandfather's creation - THE PHANTOM OF THE OPERA with Monster Basher Mark Wilhelm. 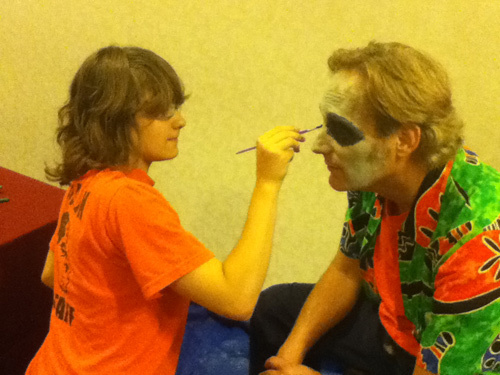 Paisley Adams working on make-ups with Todd Spidle. 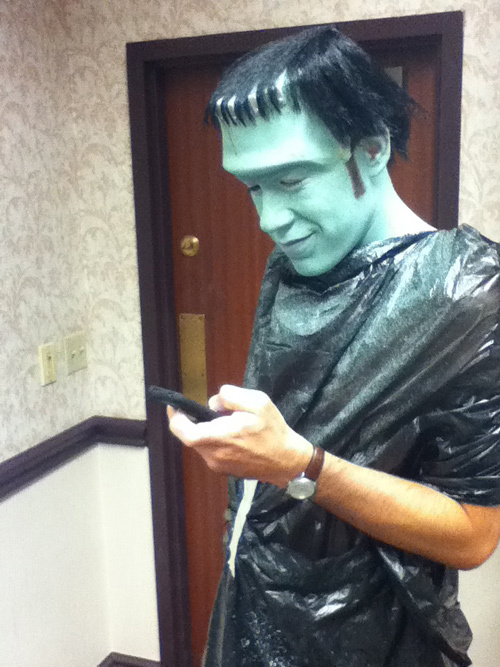 Thom Subila brings Herman Munster into the 21st Century as he texts to Grandpa Munster. 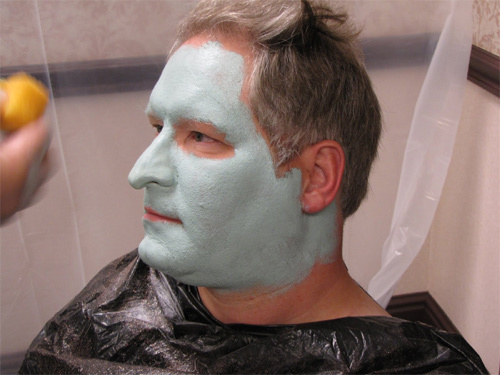 Make-up in progress by John Tatarelli and the Reel Magik Team. 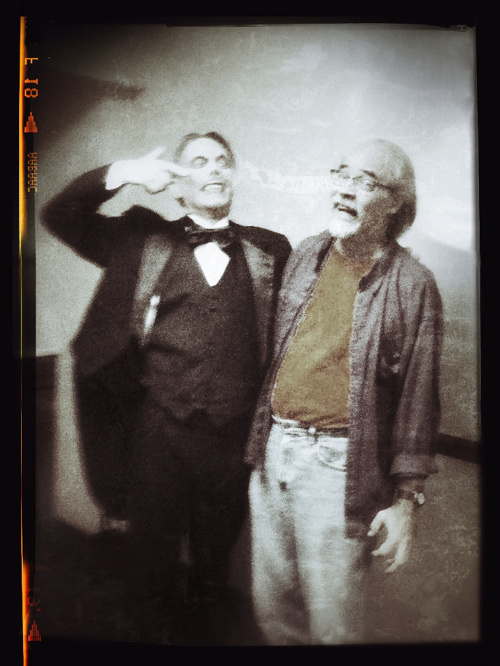 The Phantom (Ron Chaney) gives the "whammy" to Kevin Slick! 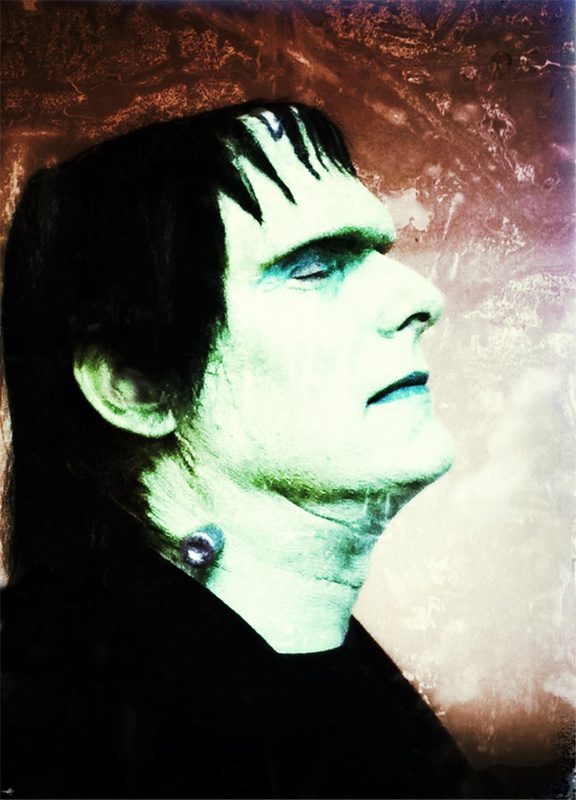 Todd Spidle as Frankenstein's monster at Monster Bash 2013. 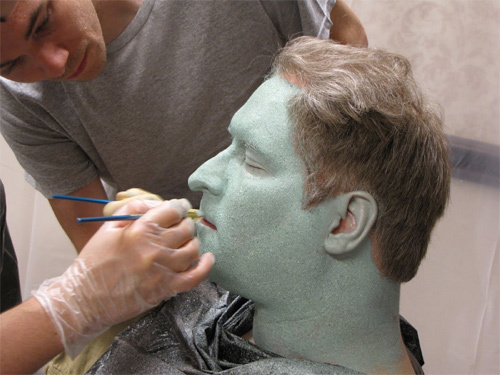 Make-up by John Tatarelli and The Reel Magik Team. Photo by Kevin Slick. 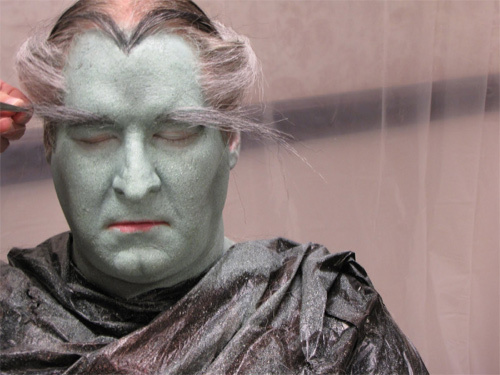 Ron Chaney as his grandfather's version of THE PHANTOM OF THE OPERA. 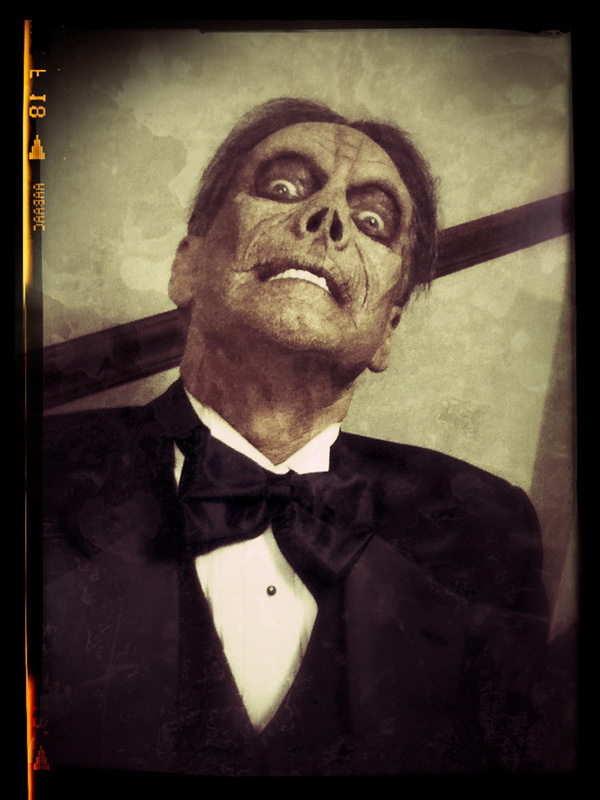 Make-up by John Tatarelli and The Reel Magik Team. Photo by Kevin Slick. 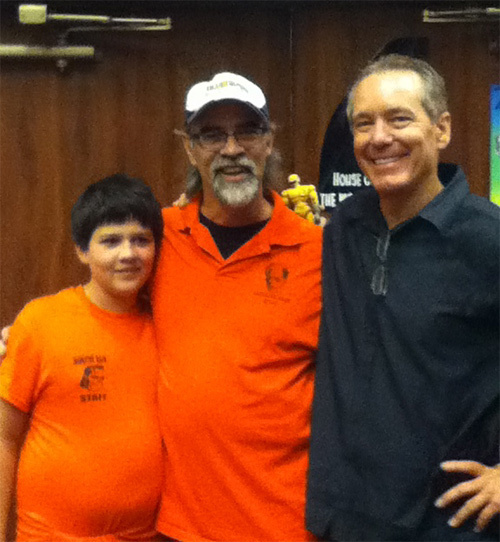 Jamie and Kevin Slick with Ron Chaney. 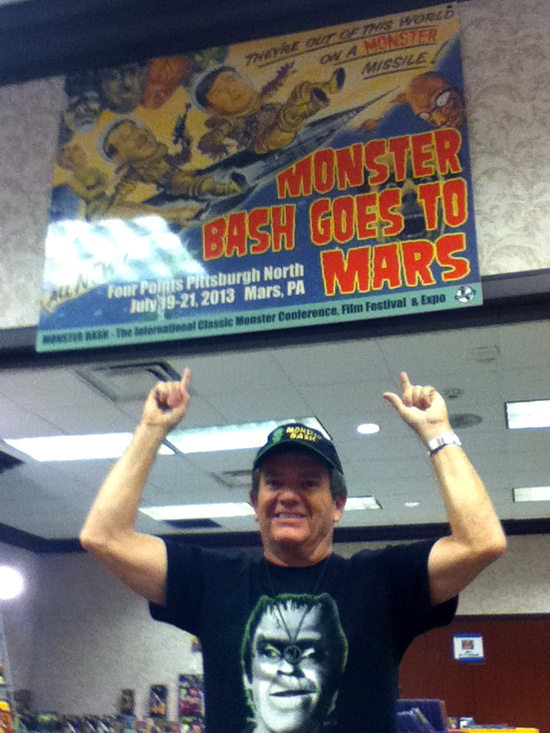 Butch Patrick having a great time Monster Bashing! Todd Spidle - Monster Bash Attack! Make-up by John Tatarelli and The Reel Magik Team. Photo by Kevin Slick. 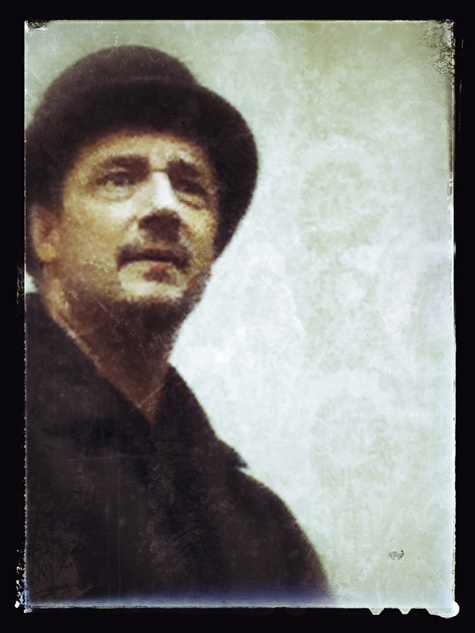 Zach Zito acts in FALL OFTHE HOUSE OF USHER, live theatre at Monster Bash. 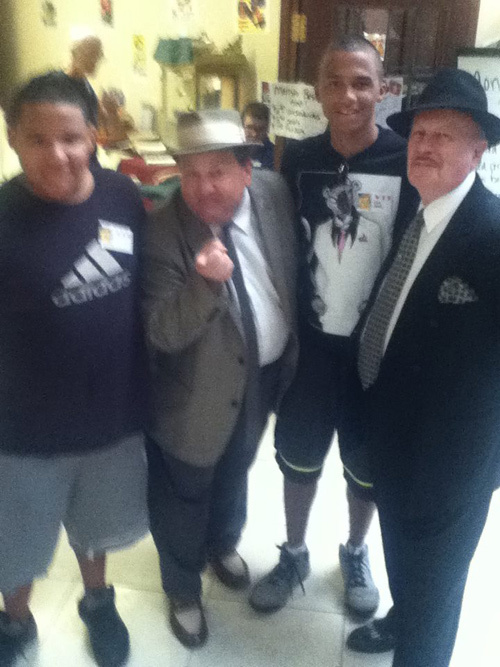 Abbott & Costello Meet The Smith's! Left to right: Cameron Smith, Lou Costello (Joe Ziegler), Nicholas Smith and Bud Abbott (Bill Rieley). 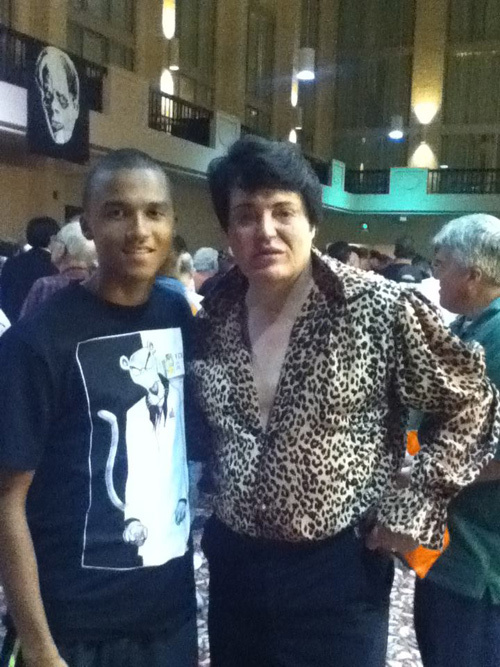 Cameron Smith with Elvis impersonator, Caesare. MANY MANY more photos coming in....stay tuned! 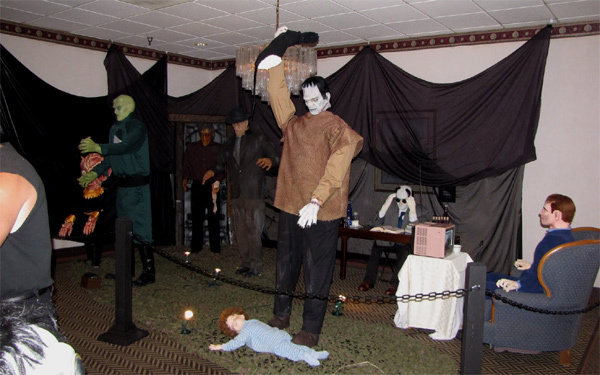 More Photos from Monster Bash 2013 - CLICK HERE!